September 28, 2011 – We have been informed by the US Fish and Wildlife Service (FWS) that they will publish their Environmental Assessment (EA) of the Rocky Flats right-of-way issue before the close-of-business this Friday, Sept. 30, 2011. 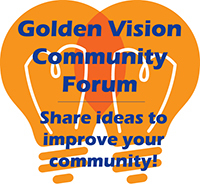 The City of Golden encourages residents to read the study and participate in the public meeting. There will also be an opportunity to submit written comments until Oct. 30. FWS will then issue their final environmental assessment some time in early December.